It is my pleasure to welcome you — the Class of 2018, families and friends, faculty and staff, and Trustees — to this special occasion. My warmest congratulations to our new graduates. You have worked diligently to get to this moment. And now you are here! This is also a special day for me, as I am completing my first academic year at RIT. What a privilege it has been for me to serve as your president. The RIT family and Rochester community have welcomed Nancy and me with open arms as we have acclimated to our new surroundings. We’ve made many friends. We are amazed and impressed by the talent and devotion that surrounds us. This includes students, faculty, staff, alumni, and our many university partners. Our transition has been wonderful and we thank you all for your support and kindness. To our graduates: It has been fun to watch you in my first year. RIT has creative students who are so full of ideas. And you have passion to implement those ideas. We are proud of all that you have accomplished in the years leading up to today. Yet today is commencement, meaning the beginning. As you launch out into the world, most of you will be entering the workforce and getting started on a career, but others will be going on to graduate school or into the military. At RIT, we are confident you have received tremendous preparation from your education both inside and outside the classroom. Many of you have engaged in, for example, wonderful co-op experiences or other forms of experiential learning. You are well prepared to undertake the rigors of the real world and get off to a fast start in your respective fields. But remember, you are RIT Tigers and so there is more to this. As you embark on building your future, don’t neglect your obligation to be part of the citizenry of the world. You are not just an individual building your own thing. You are not even just part of a team at your new company building their own thing. You have a broader responsibility to the world, and we are eager to see you exercise that. So, I ask you to ponder this question: What do you want for your community, your country, and for the world? Here in the United States and also in other nations, we have entered a period of relative isolationism. It’s now popular to believe that our problems are caused by others who are unlike ourselves. We are seeing unrest, with heated rhetoric, where people are demonizing one another rather than taking time to listen and honestly understand each other’s viewpoints and life experiences. This problem is exacerbated by 24-hour cable news coverage that allows each of us to tune into our favorite channel and simply reinforce our own views. Clearly, this is not a path that we can afford to stay on, because the fabric of democracy itself is being attacked and even beginning to unravel. Instead, we need to work together. Please allow me to further indulge you on this subject. Nancy and I have been invited to many gatherings this past year, and we’ve learned about a group that has come together in the town of West Bloomfield — about 20 miles southeast of our campus. It got me thinking that I should share their story. This group of ordinary citizens, from diverse political and world views, is working together to help create a community conversation they call “Unstuck.” These men and women hold very different positions on the political spectrum and yet they have worked to create an open and civil dialogue. Together, they drafted a set of resolutions they could agree on, instead of focusing on differences. Support democracy by encouraging citizens to talk face-to-face on serious subjects. Bring together diverse groups, including different ages, races, genders, political views, religious views and neighborhoods. Seek insights into ways to work more intelligently and effectively together. Provide a model for speaking about your experiences and hopes, without expecting to convert others. During your time at RIT, you spent time forging relationships, working together in labs, collaborating on senior projects, traveling overseas, participating in student clubs, and offering service in center-city Rochester. You didn’t do these things alone. That is why I know that you are prepared to contribute to conversations that will build our future, whether these conversations are more formal and organized, or at a coffee shop with a group of friends. Now is the time for neighbors and citizens to come together. So, it is my hope, graduates of the Class of 2018, that you wake up tomorrow not solely focused on how to earn a living. Rather, that you go out and do your best to enrich the world. 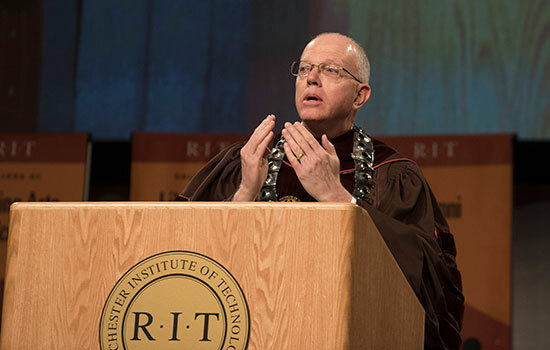 Let me close by assuring you that RIT will continue to grow and become the best it can be, along with all of you. This is your alma mater for life. Please stay in touch and visit often. Nancy and I are looking forward to watching your successes in the years ahead. Congratulations, and all of the best to each of you in the future.